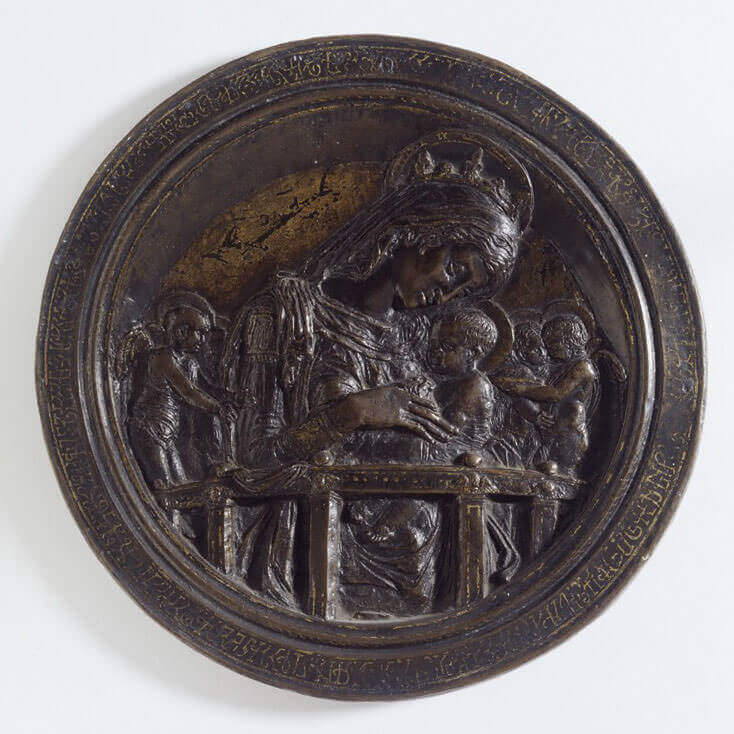 Housed today in London's Victoria and Albert Museum, Virgin and Child with Four Angels is a bronze roundel with a diameter of 28.5 cm. We know that Donatello had given the roundel to his doctor Giovanni Chellini in 1456, as documented in the physician's account book on 27 August 1456: "while I was treating Donato called Donatello, the singular and principal master in making figures of bronze of wood and terracotta... he of his kindness and in consideration of the medical treatment which I had given and was giving for his illness gave me a roundel the size of a trencher in which was sculpted the Virgin Mary with the Child at her neck and two angels on each side." The relief carving of the Virgin and Child in a roundel was rare before the Renaissance, but by the fifteenth century it became a standard element in the upper part of wall monuments. The reverse of this roundel is hollowed out, creating a mould that allows the casting of replicas of the image in molten glass. The roundel is unique as no other bronze has such a precise negative mould. In addition to this function, the roundel may have been intended as a birth tray (a tray laden with sweetmeats brought to a mother after childbirth). The two cherubs on the right-hand side are carrying a heaped bowl in offering, perhaps in reference to this use. The circular design corresponds to Renaissance architectural forms based on pure, geometric shapes. Instead of treating the tondo shape simply as a frame, we can view the Virgin and Child through the aperture in the thick wall and behind a railing, adding a sense of depth to an otherwise small, flat surface. The crescent shape of the reveal above and the rising rail below provide only a small stage for the scene, establishing a low viewing point. Donatello's use of perspective marks a dramatic advance in comparison to earlier roundels of the Madonna and Child, where spatial depth was rarely accounted for. The success of the piece inspired him several years later to adapt it for a large roundel in Siena Cathedral. The Virgin and Child with Four Angels probably arrived in England in 1749, after it was bought from the doctor's descendants by Lord Malton while on the Grand Tour. It then passed through the ownership of successive Earls Fitzwilliam before being sold in 1954, when its authorship had long since been forgotten. In 1975 it came to the attention of the former Director of the Victoria and Albert Museum, John Pope-Hennessy. When leaving a dinner party at the American Embassy, he ran into the art dealer David Carritt, who told him that he had found a circular fifteenth century bronze relief being used as an ashtray. "I asked him to let me see it," explains Pope-Hennessy, "and he brought it round the following day. Its front face corresponded with that of the other reliefs. But what mattered was the reverse, and when I turned it over I found the mould described by Chellini." The piece was destined to be exported to America, but following a public appeal and the sale of limited edition silver casts from the reverse, the roundel was secured for the London Museum in 1976.